You are a beloved child of God, beautiful to behold. You are a beloved child of God, beautiful to behold. That's a line I use often in my ministry, but it's totally stolen. In seminary, I had a Methodist bishop as a professor, whose class we affectionately called “Story Time with Bishop Carder.” More often than not, we barely made it through the syllabus. Instead, Bishop Carder would tell stories of his time in ministry, as a local preacher, all the way up to his time as a bishop. Sometimes the stories made little impact, sometimes they seemed to make little sense. But a few are true gems, and one of them has been echoing through my head since the day I heard it. 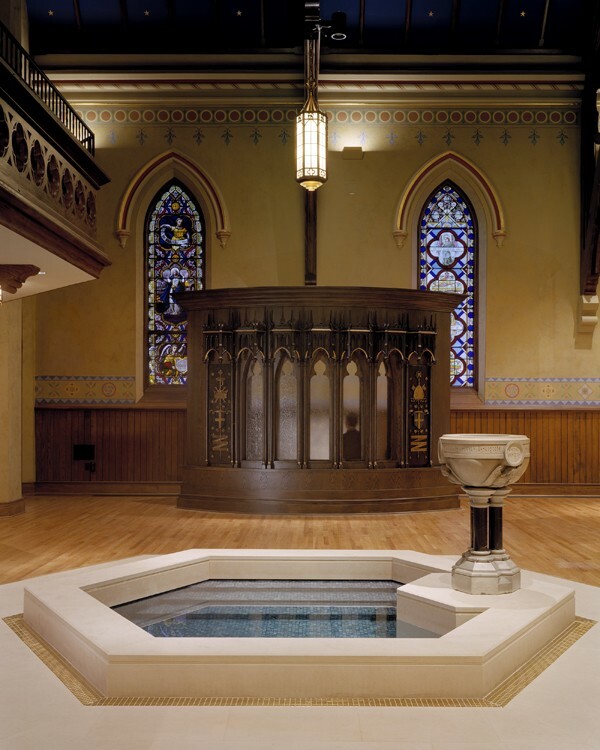 In one of the churches he served, he actually had a full immersion baptismal pool. Quite rare for most liturgical churches. When adults would come to him for baptism, after they were immersed into the pool, and as they were coming up out of the water, Bishop Carder would say that wonderful line over them: You are a beloved child of God, beautiful to behold. 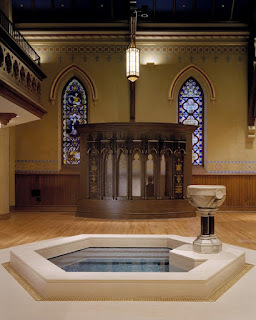 On one particular occasion, Bishop Carder was baptizing a woman whose reputation was sullied by very poor and public life choices. But she found Jesus in that church and wanted to be baptized into his life, death, and resurrection. True to form, Bishop Carder immersed her and said that wonderful line. He recalled her tears mingling with the baptismal water, her absolute joy at receiving new life, and her expression that she had never felt so beautiful as she did in that moment. She knew deep down in her bones that she was someone deeply beautiful, someone who caught the eye of God, someone whose self-worth was defined not by her mistakes, or choices, but by the grace of God taking root deeply in her soul. I've never forgotten that story, and that wonderful line has become important to my ministry, and it is stories and teachings like those we've heard today that strengthen my conviction that we are all beloved children of God, beautiful to behold. I can’t tell you how often I have counseled people who come to me with a tragically low sense of self-worth. The sense that they are broken in some deep and unchangeable way. And it breaks my heart to hear people speak who have become convinced that the grace of God, the love of God is simply not for them. Thank God, then, that the Church has continually witnessed to the way Jesus can take some of the most broken people and use them to set the world ablaze with the love of God. And believe it or not, I see the same kind of work at play in Jesus’ breaking and multiplying the bread and fish. 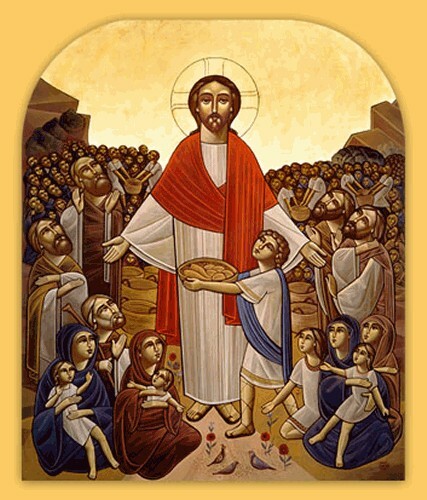 It does me little good to remember that Jesus once multiplied bread and fish for a hungry crowd. I want to know what this story, this miracle, might mean for me today. John tells us that the crowds continued to follow Jesus because of ‘what he was doing for the sick.’ Something in Jesus, in his manner, his presence, told them that here was a man who could offer them health, wholeness, and salvation. 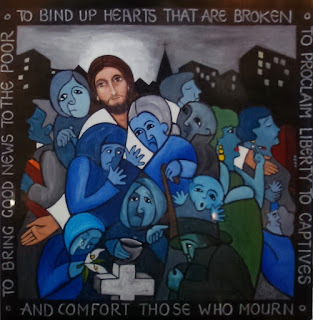 Hoping to feed the presumably hungry masses, Jesus offered the question, setting the stage for his miracle: Where are we to buy bread for these people to eat? 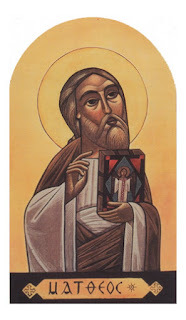 And Andrew’s reply says it all, says what I think many of us might think of ourselves when we are trying to figure out what God might be calling us to do for the life and salvation of the world: There is a boy here who has five barley loaves and two fish. But what are they among so many people? But what are they among so many people? As if to say, such a small, paltry amount of food, such an insufficient amount, could never feed and satisfy these people. And Jesus, as he always did and as he still does, surprised his disciples with what he could do. Then Jesus took the loaves, and when he had given thanks, he distributed them to those who were seated; so also the fish, as much as they wanted. Though anyone who was present would have naturally assumed that such a small amount of food could do nothing, absolutely nothing, to satisfy the hunger of the people, Jesus gave thanks and began to break the bread and pass around the fish. And John is quick to say that the people were able to feast on as much as they wanted. There was no rationing here, no paltry amount of bread and fish. This became a feast that knew no bounds, that was overflowing so much it filled twelve baskets. This feast, then, is a witness to the way Jesus Christ can take even the most insignificant of things, things assumed to be nearly worthless, and bring forth from them a bounty, a feast, that satisfied the hungry with some left to take home. Taking things assumed to be broken and insignificant and using them to transform the world is a hallmark of Jesus’ ministry. He joined up with a tax collector, one of the most hated classes of people in the ancient world. The word around first-century Palestine was that Jesus was “a glutton and a drunkard, a friend of tax collectors and sinners.” People that the world assumed were worthless and broken, Jesus looked deeply into them and saw the potential to transform the world and the beauty inherent in them as people made in the image of God. So what at first glance is a recollection of a miracle can take on greater significance. Jesus took such simple things as bread and fish, in this case assumed to be insufficient and worthless, and used them to satisfy the hunger of five thousand people. Imagine, then, what he can do with us. So what does this say to those among us who might assume that they have nothing to offer, that they are broken and insignificant, that the love of God is not for them? Perhaps it says that Jesus sees within us the potential to work wonders among a world hungry for love, acceptance, and salvation. We know that God has been in the business of taking things assumed to be insignificant and multiplying them, using them to witness to his power. Elisha took loaves of barley and fresh grains and fed a multitude. And St. Paul, in Ephesians, declared something similar of the God we serve: Now to him who by the power at work within us is able to accomplish abundantly far more than all we can ask or imagine, to him be glory in the church and in Christ Jesus to all generations, forever and ever. Amen. And he goes even further and speaks of the earth-shattering potential of human beings to be vessels of the presence of the living God: I pray that you may have the power to comprehend, with all the saints, what is the breadth and length and height and depth, and to know the love of Christ that surpasses knowledge, so that you may be filled with all the fullness of God. What an amazing declaration of us, that we can be filled with all the fullness of God. That we, flawed humans as we are, can be filled with all the fullness of God. It’s a potential given to us at birth, a kind of beauty that comes with being a human being created in the image of God. And yes, that inherent, received-at-birth beauty is sometimes buried deep within us, covered over by things that seek to hide who we truly are inside. Our beauty and potential can be masked by a tragic sense of self-worthlessness; or perhaps masked by years of being told we aren't beautiful, that we are marred and scarred and beyond redemption. Sometimes that beauty is masked by the choices we make, the sins we indulge in, a hiding of the light within done by our own hand. But whatever the reason, we engage in spiritual practices, in prayer, bathing ourselves in words like these from St. Paul...words that remind us how we all have the potential to be filled with the fullness of God. And nothing can take that birthright away. I spoke last week of ‘showing my cards’, of letting you get a sense of what I’m passionate about. And I’m passionate about this…about declaring the grace and mercy of God in Christ that takes things that might be easily dismissed and showing the world their inherent dignity, power, and beauty. 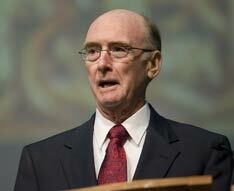 As Bishop Carder says, You are a beloved child of God, beautiful to behold. So, I don’t really know what to tell you if you ever get tired of hearing me say to you, “You are a beloved child of God, beautiful to behold’. But, if I were a betting man, I’d be willing to bet that many of us need these affirmations time and time again. I know I sure do. So let me say it one last time, “You are a beloved child of God, beautiful to behold.’ For you bear within yourself the fullness of God. Don’t forget this truth, and shout it aloud any chance you get. *A sermon preached at Trinity on the Hill Episcopal Church in Los Alamos, NM on July 26, 2015. The texts were 2 Kings 4:42-44, Ephesians 3:14-21, John 6:1-21.